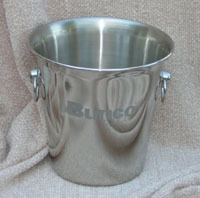 This Bunco Ice Bucket of Stainless steel mirror finish for long lasting beauty comes etched with Bunco and Dice. Perfect for a Bunco gift or for serving your Bunco Wine or drinks. Be creative!!! Create your Bunco Night theme around these great Bunco Accessories.